Increase your spread for the V-taper physique all bodybuilder's covet. Nothing looks quite as ridiculous as huge, ripped biceps attached to a back with the width of a spider monkey. Building an enormous, wide back is crucial to your overall aesthetic. Not only is a wide back imposing in and of itself, but it also makes your waist look smaller, increasing the ever important V look all bodybuilders covet. On your next back day, add in these 4 exercises and watch your back width explode. These effectively isolate the lats, resulting in a serious increase in back width. Put the handle attachment on the lat pulldown stack. Grasp it with one hand and fell a big stretch on the top. Pull it down so the handle is at shoulder level. One-arm lat pulldowns should also be done with the strictest of form, and muscle intention is key here. Feel the lats doing the work. Do 5 sets of 10-15 repetitions. 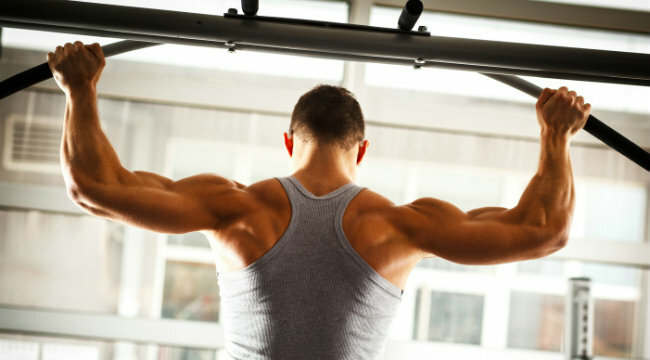 Wide grip pullups are absolutely essential to developing an impressively wide back. They are more lat intensive than their normal grip counterpart. To perform wide grip pullups grasp the pullup bar wider than shoulder width, and make sure to come all the way down on each rep. Use muscle intention to really feel your lats doing the work. Pull yourself all the way up so that the pullup bar is at around chest level. Do these strict (no swinging, go all the way down and all the way up.) Once you can do 10 strict wide grip pullups, start adding weight. Do 5 sets to failure in this exercise. These are not as popular as they once were, they used to be a staple in back training. Let’s bring back this oldie but goodie. Put the V-Grip attachment over the top of the pullup bar, pull yourself up and touch your chest to the v-bar attachment. Concentrate on using your lats and upper back to pull yourself up. Keep these strict, no swinging. Do 5 sets to failure. As you can see, when trying to develop a wide back strict form and muscle intention are key. Add these exercises in on your back day and watch your spread grow.